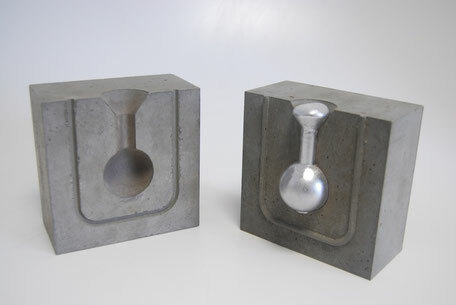 Heat Resistant Special Concrete Molds for Aluminum Casting, developed by G.tecz. Nano optimized concrete matrix systems are enabling new solutions, not only in the building industry. G.tecz Engineering’s latest development is a high temperature resistant optimized concrete matrix, based on Portland cement in combination with other cements and high temperature resistant fines. The material can take temperature shock loads of 900°C up to 1400°C in a short time range while keeping mechanical performance for an outstanding time span. Next to the outstanding mechanical performance and thermal resistance, the material is extremely affordable compared to industrial standard molds made of steel. Fields of applications are molds for liquid metal casting as well as chassis for high temperature ovens or heat shields of machines. 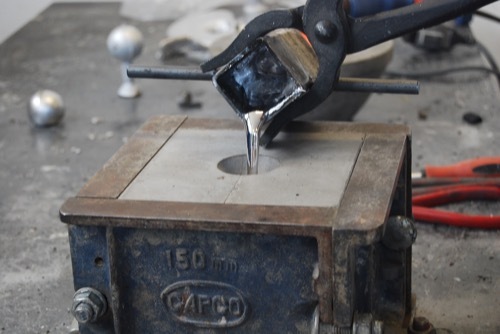 Application – The new developed concrete was tested in laboratory as well as industrial scale for aluminum casting. Industrial partners from the automotive industry proofed the concept and economical aspects of the technology. Main idea of the concrete mold is to replace steel molds for prototype developments as well as usage for zero and small series productions. Easy to realize concrete molds due to the fluid concrete behavior due to its self leveling and doesn’t require temperature treatment for the hardening process. Simple and precise form generations (olds of the molds) by 3d printing the negatives. 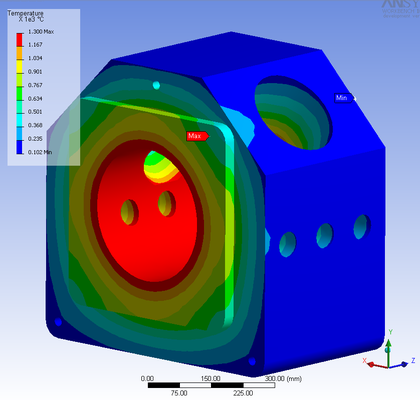 Surface near cooling or heating channels are possible and can be directly integrated in the concrete mold. Release agents are not necessarily required for the aluminum casting. High compressive strength of the concrete is possible, up to 300Mpa. G.tecz’s industrial partners tested the mold system with 900°C hot and fluid aluminum that was casted in the pre-heated concrete mold as well as aluminum injection molding with 800bar pressure. Both tests were successfully mastered by the concrete mold. Molds and aluminum parts were made as test elements for engines for cars. The precision of the casted aluminum elements hat been very high and tolerances were accepted. The concrete mold technology is also interesting for small companies (SME) that are related to the liquid metal molding industry and are producing smaller aluminum elements like door or window handles, spare parts for cars, machine parts and so on. G.tecz developed a complete and simple solution: Clients can develop their products via computer aided design (CAD) and print their mold negatives with a simple 3D Printer. 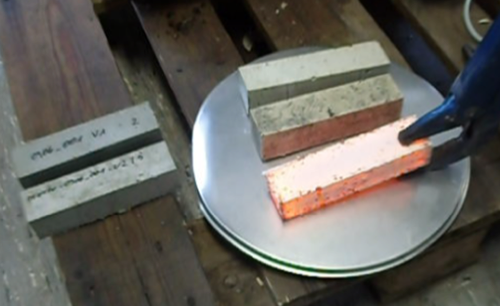 The printed negative is used for concrete casting – that’s it. The whole process can be done within hours, very cost effective and independent from suppliers. Further applications of the heat resistant concrete are chassis of oven systems as replacement for ceramic tiles. New oven systems are heated with gas turbines and are performing a temperature difference from 20°C to 1400°C within 2 minutes only. General oven systems with ceramic heat shields do show erosion problems after a few weeks, concrete shields don’t. Advantage of those oven systems, compared to electronic heated systems, they can be used in periods only and if required for a few hours; they don’t have to be heated over days. Advantage of the special concrete heat shield is the high temperature resistance, the affordable price and the possibility to design the oven in a complete new design. Secondary steel structures and constructions are not required. Because of the fluid concrete, any geometry can be realized – monolithic plug and play prefabricated oven blocs can be produced. G.tecz is specialized in the development of cement bonded high tech materials for the industry. Tailor made economic and ecologic solutions from small series to big industrial applications. The company offers complete solutions from material development, mold and product innovations up to consultancy for setting up production lines and production facilities. Link to the CONSTRUCTION REVIEW ONLINE paper.